Gorillas (Gorilla gorilla and Gorilla beringei) are ground-dwelling, predominantly herbivorous apes that inhabit the forests of central Africa. They are some of the most powerful and striking animals, not only for their size and force, but also for their gentle, human-like behavior. Gorilla social groups typically consist of an adult male or silverback, multiple adult females and their offspring. Group size is usually 5-10 individuals, but can vary from 2 to over 50 members. The bond that a silverback has with his females forms the core of gorilla social life. Gorillas are mainly plant eaters and spend almost half of the day feeding on stems, bamboo shoots, and a variety of fruits, supplemented with bark and invertebrates. Gorillas are stocky animals with broad chests and shoulders, large hands, and forearms that are much shorter than the upper arms. The face is black and hairless, with small eyes that are close together and large, prominent nostrils. Adult male gorillas are known as silverbacks due to the characteristic silver hair on their backs reaching to the hips, and have a sagittal crest along the midline of the skull. The eastern gorilla is more darkly colored than the Western gorilla, and has a longer face and broader chest. 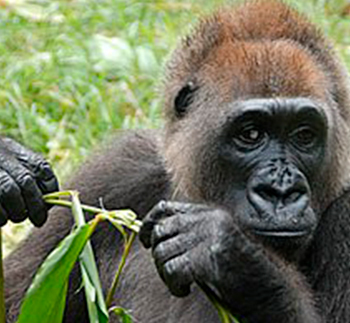 The Western Lowland gorilla can be brown or grayish with a reddish forehead. The largest living primates, wild male gorillas weigh 135 to 180 kg (298 to 397 lb) while adult females usually weigh half as much at 68-113 kg (150–249 lb). Adult males are 170 to 180 cm (5.6 to 5.9 ft) tall, with an arm span that stretches from 230 to 260 cm (7.5 to 8.5 ft). Female gorillas are shorter with smaller arm spans. 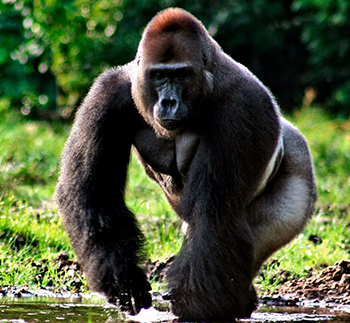 Western Lowland gorillas are found throughout the forests of Gabon and Congo, the forested southwestern part of the Central African Republic, southern Cameroon, mainland Equatorial Guinea and the Cabinda province of Angola. 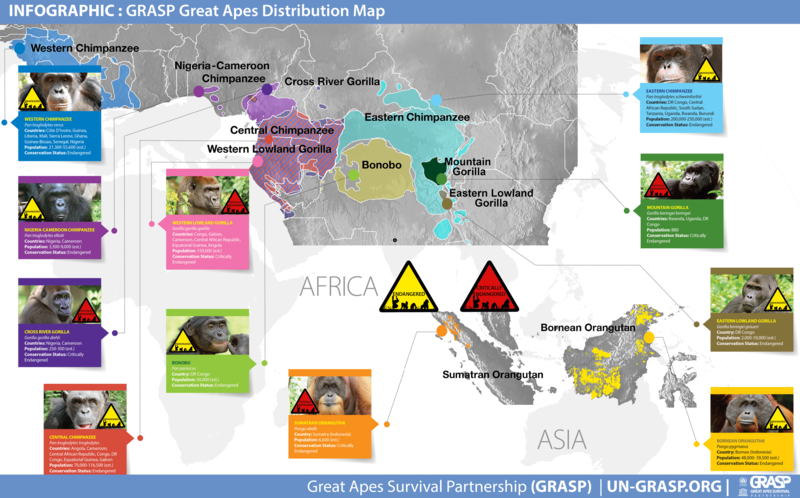 The range of the Cross River gorilla is restricted to the hilly rainforest region along the Nigeria–Cameroon border, scattered across a surface area of approximately 12,000 km². The Mountain gorilla is found in two isolated subpopulations: Bwindi Impenetrable National Park (Uganda) and the Virunga volcanoes region (Rwanda, Uganda, and DR Congo). 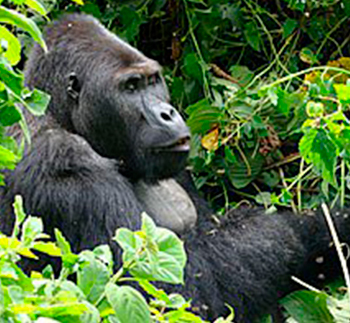 The Eastern Lowland gorilla is found in the forests east of the Lualaba River and the Burundi–Rwanda–Uganda border. Female gorillas are sexually mature at around 7-8 years of age. However, they do not usually reproduce until they are 10-12 years old. Males mature later than the females (11-13 years of age) and are rarely strong and dominant enough to reproduce before 15 to 20 years of age. Gorillas mate year round. The gestation period lasts 8.5 months. Birth intervals for wild Mountain gorillas are 4 years. Male gorillas are not active in caring for the young, but they do play a role in socializing them to other youngsters. 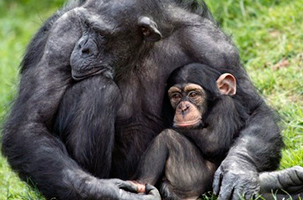 Infants begin to break contact with their mothers after 5 months, slowly increasing the time and distance between them and their mothers until being weaned at around 3 years of age. 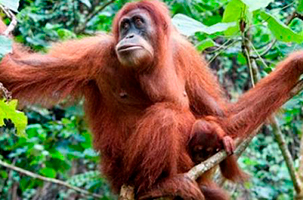 After their offspring are weaned, females begin to ovulate and soon become pregnant again. A gorilla’s lifespan in the wild is normally between 35 and 40 years. Senkwekwe Center, the world’s only Mountain gorilla orphanage, in DR Congo. 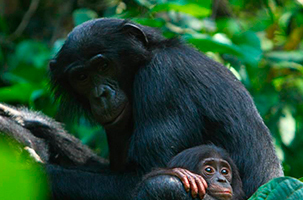 Observe the orphans in their daily lives, meet some of the courageous keepers that care for them, and share in the message of hope for a day when these magnificent apes can be reintroduced to the wild. Tracking the Susa mountain gorilla group, Mount Karisimbi, Rwanda. Join your guide, Ian Redmond, and a group of intrepid tourists as the adults of the Susa gorilla group take a siesta while the youngsters wrestle and play in their very own jungle gym. 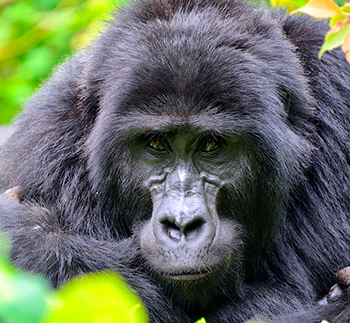 Experience the unique Kwita Izina gorilla naming ceremony, Rwanda. Access-all-areas tour of the Kwita Izina – the annual gorilla naming ceremony in Rwanda.